I am not a Chef by any means. 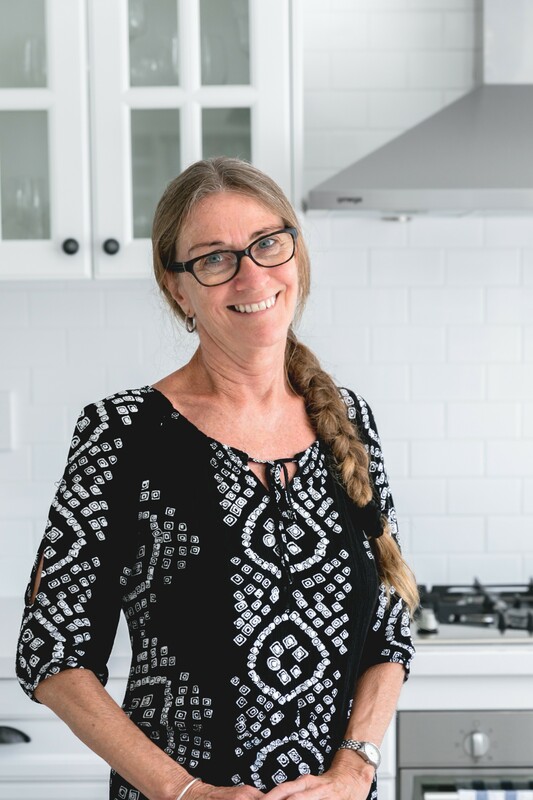 I am a home cook, (Nutritious Life Certified) and Nutrition, Health and Wellness Coach through (Cadence Health) that loves to nourish myself and my family with food that is nutrient dense to maximise satiety and that tastes good. I avoid processed foods as much as possible and JERF (Just Eat Real Food). The benefits of eating whole food, fuels your body to provide more energy, healthy fat loss, improves your health and puts you in a better frame of mind. When it comes to eating healthy, you need to set yourself up for success. A well organised kitchen starts with the preparation of the basic ingredients. Here are my 5 Essentials to maintain a Healthy Kitchen and that keep me energised and reduces the risk of illness. I include these on a daily (and/or weekly) basis and add why they are so beneficial for our health! Most of all, they taste awesome! 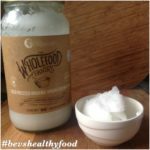 Coconut oil contains short term medium-chain saturated fatty acids (MCFAs), which is a “healthy” form of saturated fat compared to trans fat. MCFAs are easily digested, thus putting less strain on your digestive system. Our body metabolises these fats in the liver, immediately coverting this into energy (fuel for the brain and muscle function) rather than it being stored as fat. It aids in weight loss by converting to energy rather than being stored as fat. It also supports the Immune System as it is made up of healthy fats lauric acid, caprylic acid and capric acid which contain antifungal, antibacterial, antiviral properties to boost the immune system and contains Glutathione an Antioxidant which is an essential part of staying young, active and healthy. How to use it:- I use coconut oil in my baking as a substitute for butter & other oils 1:1, for frying as it adds a great taste and aroma. It is also great to curb sugar cravings. All good reasons to start using today. The ginger plant can be consumed fresh, powdered, dried as a spice, in oil form or as juice. Ginger is part of the Zingiberaceae family, alongside cardamom and turmeric. The ginger bulb has many uses and is known to aid: with digestion to relieve nausea and motion sickness. It has anti-inflammatory qualities that help relieve swelling and pain. The most common benefit is as a tea to help ease sore throats, coughs, cold and flu symptoms. Ginger contains high concentration of antioxidants and anti -inflammatory agents including gingerols which help reduce pain caused by muscle aches, headaches and rheumatism and shogaols which is a pungent constituent of ginger and it is produced when ginger is dried or cooked and provide a stronger anti-inflammatory effect. The primary job of antioxidants is to protect our cells against the oxidative stress caused by free radicals, considered to be the primary cause of the ageing process. Protecting ourself against free radicals with antioxidants is the most effective way to reduce the risk of many health problems associated with ageing. 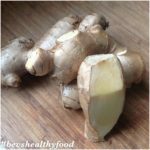 How to use it:- Ginger is one of my favourite spices and I use it fresh everyday in my smoothies as well as in my cooking and baking. It is also a great addition to butter, similar use of garlic butter. No matter what its use is Ginger is healing and if you don’t already use it, start today! In the past when I thought of Garlic, I often conjured up visions of newborn babies with strings of garlic cloves around their necks to protect them from evil spirits! Superstitions from ancient Greece. Even in modern day this has been used to keep the flu germs away, not such an attractive remedy and not sure if it really worked? Irrespective of that Garlic has some amazing health benefits. Garlic is high in manganese, (which is very important for the normal functioning of the brain and proper activity of our nervous system throughout the body) has a good source of vitamins B6 and C. It contains several important phytochemicals which act as antioxidants that help fight disease. 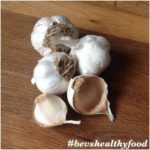 When a clove of garlic is crushed or chopped the enzymes in the garlic change their compounds which helps the garlic to become more active antioxidants, offering greater protection against disease. It also helps to prevent and reduce the severity of common illnesses like the flu and common cold. Garlic adds flavor to your dishes quickly and easily without unhealthy fats or processed ingredients. How to use it: The key to making the most of garlic is to use as much as possible in your diet. I always have fresh garlic on hand and you can also get fresh garlic already peeled for you ready to use. Fresh minced garlic preserved in a light oil base which retains all its nutrients is also an available option. Just make sure there are no hidden ingredients i.e. sugar. I love garlic and add it to sautés, stir-frys, marinades, soups, sauces, curries, salad dressings and garlic butter. Definitely apart of a healthy lifestyle. 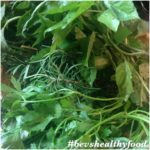 I love the addition of fresh herbs in cooking, baking, salads and smoothies, everything can be made better with the addition of the fresh, aromatic leaves. Herbs can magically flavour up dishes and by adding a little green to a meal it is adding more greens into your diet. Packed with a surprising number of antioxidants in their little leaves, they add a wonderful flavour and aroma to any dish. Try to use fresh herbs when you can as they may lose nutritional value during the drying process. Fresh is best! Parsley, rich in bone-strengthening vitamin K and is also an excellent source of vitamins A and C. There is a number of flavonoid compounds, such as apigenin, which has been shown to possess remarkable anti-inflammatory, antioxidant and anticarcinogenic properties. Plus chlorophyll and essential oils to freshen your breath. Good to know, especially after eating Garlic! Rosemary is a member of the mint family and is a good source of iron, fibre and antioxidants which can be effective in the protection of the brain from disorders such as Alzheimer’s. That is fabulous! Plus helps strengthen the immune system and the aroma alone can make you feel better! Basil is a good source of antioxidants, rich in vitamin K, zinc, calcium, magnesium, potassium and dietary fibre! It also has been found to contain oils and flavonoids that protect the body from illness, infection and is a known anti-inflammatory and you thought basil was just for Pesto? How to use them:- Herbs also give new life when used on leftovers. Keep a variety around, basil for tomato sauces; pesto and salads; rosemary for marinades or on roast chicken; parsley can go in just about every dish you cook, sprinkle a little on roasted lamb, grilled steaks, fish and vegetables. Other delicious herbs are coriander, a great addition for Mexican fajitas, and chicken curry; mint can be used in both sweet and savoury dishes and drinks – lamb, peas, ice cream, smoothies and mojitos. Add herbs to your diet and reap the benefits! 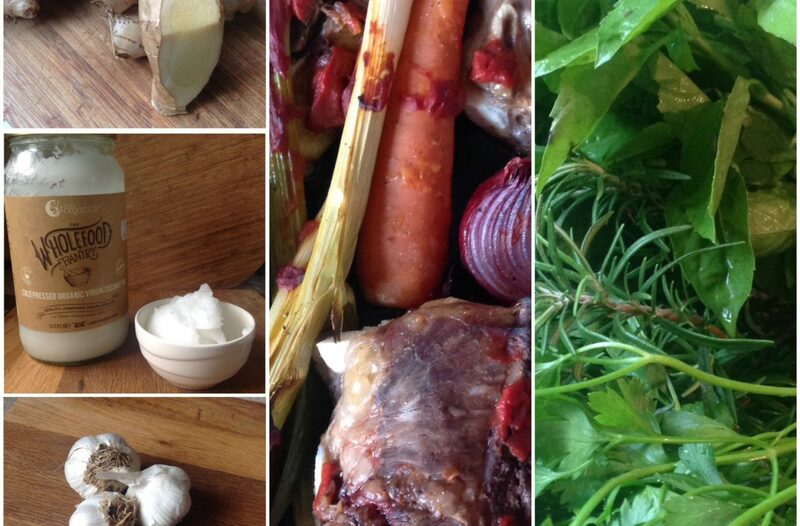 The basis of a good meal is good stock. A Chef will tell you this is the basis of the flavour of many dishes. Locked away inside those bones is a wealth of essential nutrients – anti-inflammatory and gut-healing proteins, healthy fats, and a wealth of minerals just waiting to be used. I like to make a batch each week changing the bones from beef, chicken etc to get a better variety. There are amazing health benefits from consuming bone broth. It is nutrient-dense, aids digestion, it is great for rheumatoid arthritis, joint pain, it helps to rebuild the gut, combats stress and inflammation plus it is good for our hair and nails! and rich in flavour, it tastes so much better than store bought stock. 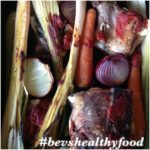 If you want real bone broth and real bone broth benefits, you need to make it yourself at home. How to use it:- Whether beef, chicken, lamb or fish, these are great to make soups, stews and sauces. It also makes a great substitute for oil when sautéing vegetables. I store my broth in 1-2 cup size containers in the freezer for quick access. If you are buying broth, read the ingredients list and avoid those that contain added sugar, caramel colouring and gluten. Buy low-sodium whenever possible. Make a batch of nutrients. Bottoms Up! There are so many more wonderful essential foods to keep in the kitchen. 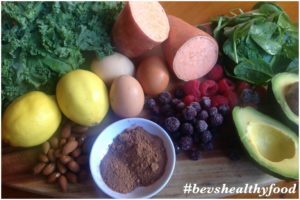 My other must haves are lemons, spinach, kale, activated almonds, eggs, cacao, sweet potatoes, raspberries, blueberries, avocado and tons more! Do you use any of these already? Which ones or is it all of them. 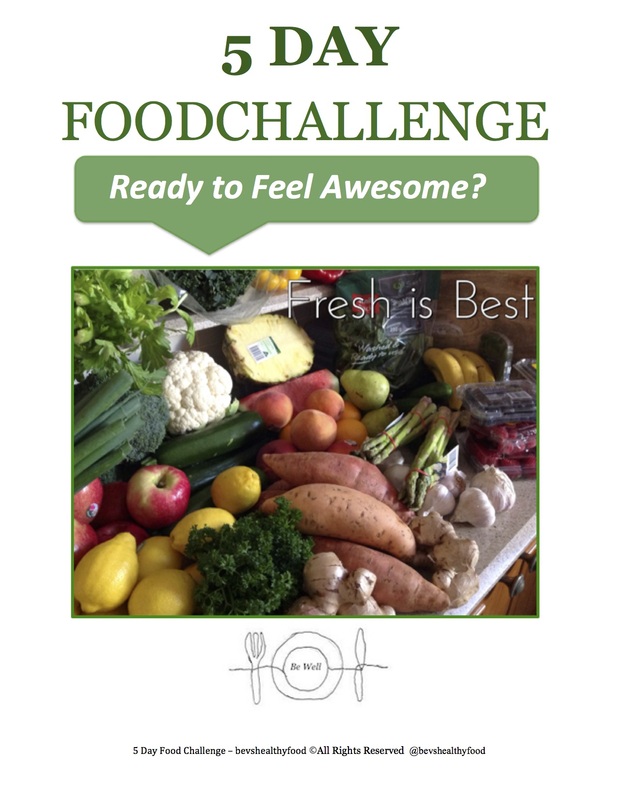 What haven’t you tried lately, be sure to check them out at the local supermarket, health-food store or farmer’s market. If there is anything you would like to know more about please write me a comment and let me know! 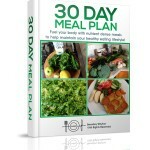 by Eating Delicious Meals All Day!